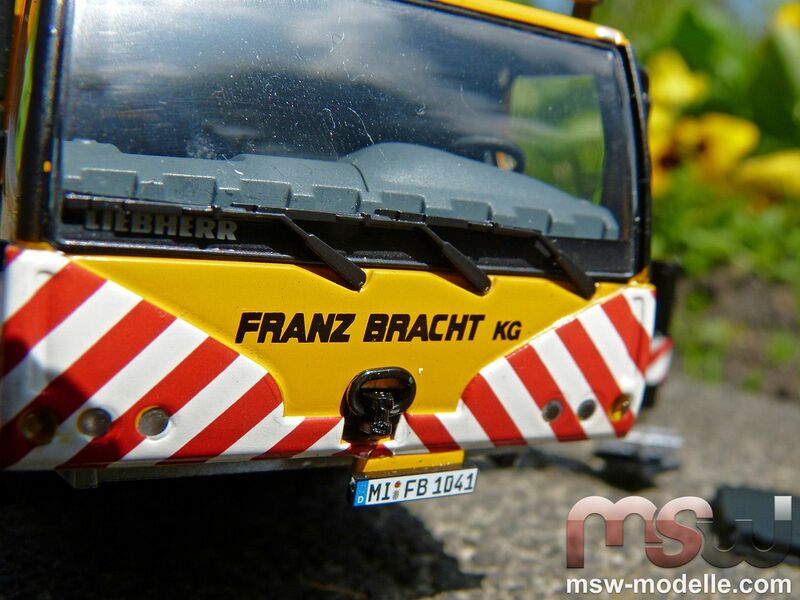 MSW Modelle presented recently the LTM1050-3.1 in „Franz Bracht“ livery. Norbert Mietz had the idea to introduce this popular version during the 2012 summer. 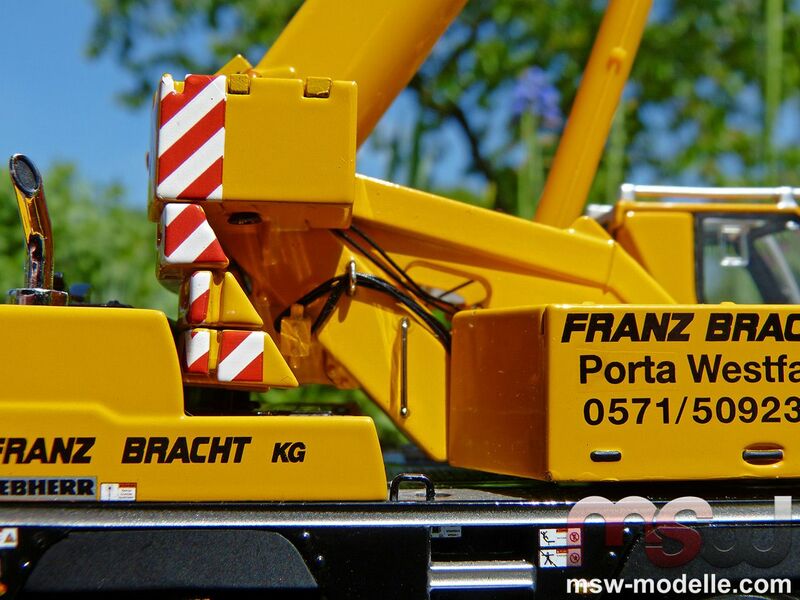 And it didn’t really take a long time after some phone calls, meetings and pictures and the LTM1050-3.1 was available with perfect inscriptions including nice decals – of course with support of the real crane’s owner Franz Bracht KG. 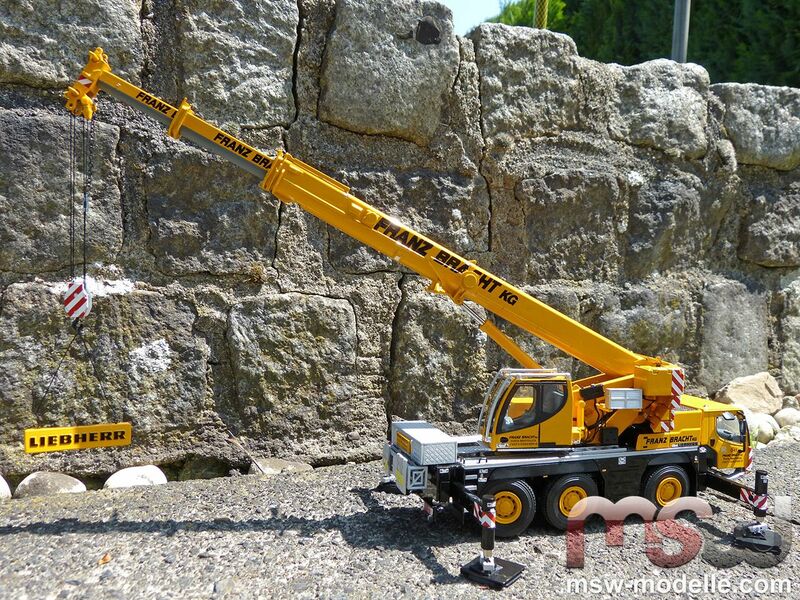 This crane was the very first AT crane model from WSI and features amazing details and high functionality. 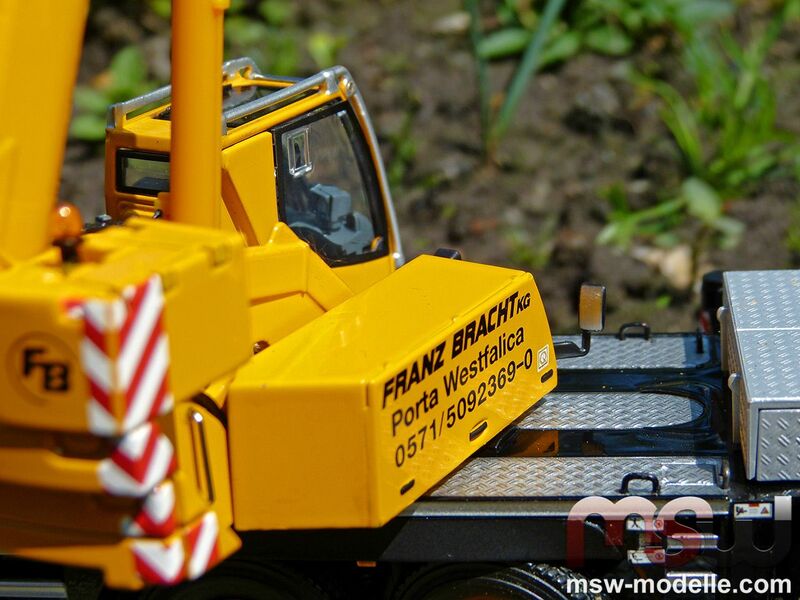 With this LTM 1050-3.1 WSI had realized unique details and set also new standards while having a fully functional model – as in reality. 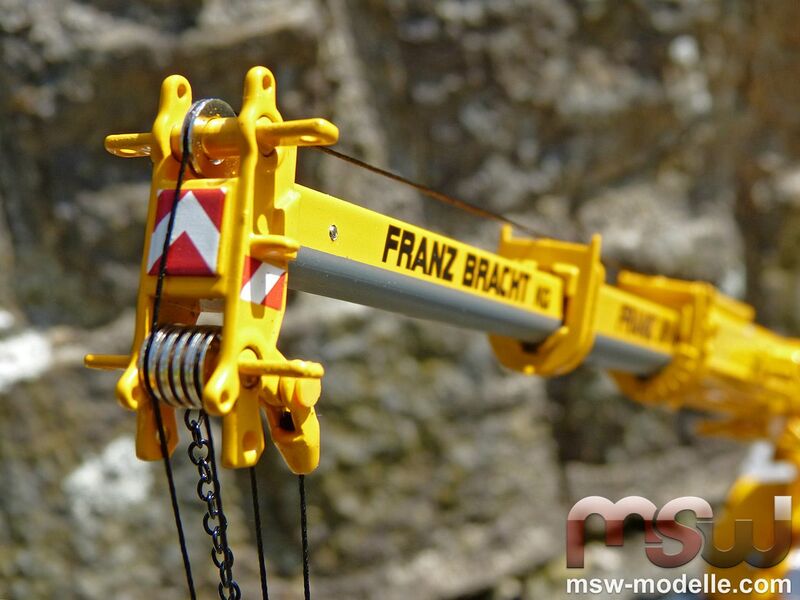 Especially the outriggers and the all-new rope clamp have become a standard feature on WSI’s today’s models. 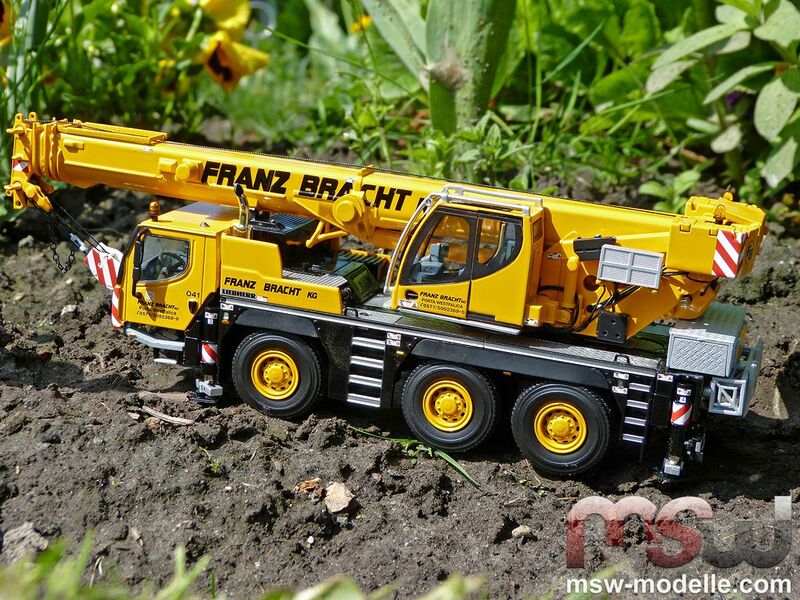 So luckily, thanks Norbert Mietz initiative, collectors now have that nice LTM1050-3.1 crane model available in the well-known “Franz Bracht” colors. 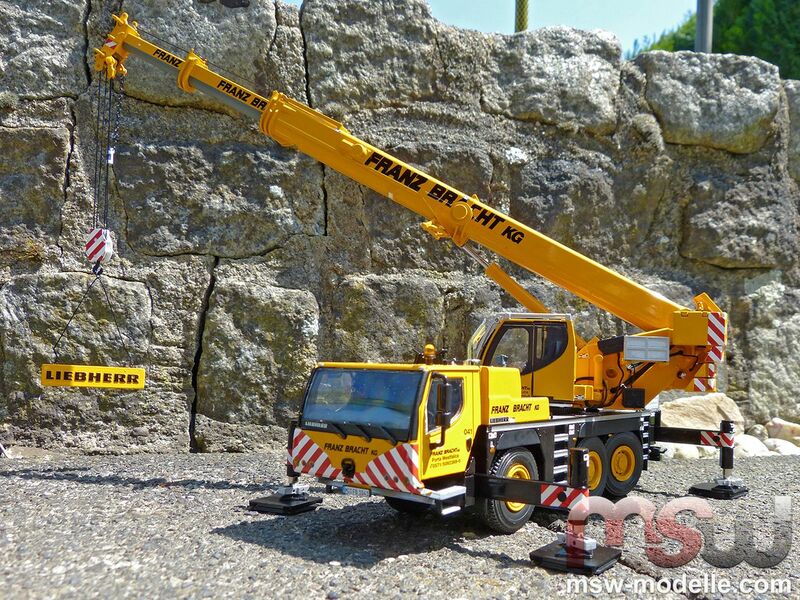 The crane travels easily on the surface and all axles are steerable, so that even a tight turning radius can be managed without any problems. 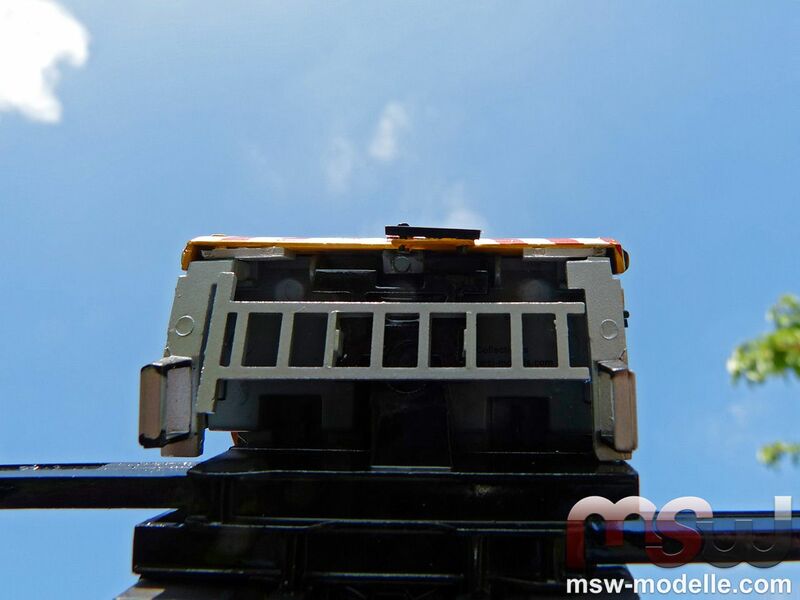 Drive train and cardan shaft including fine hydraulic hoses can be seen on the underside of the crane. ...or during an application while sitting on crane mats. A small pin keeps the pads in position. The screw thread is not visible but arranged on the inside and looks therefore authentic as in reality. 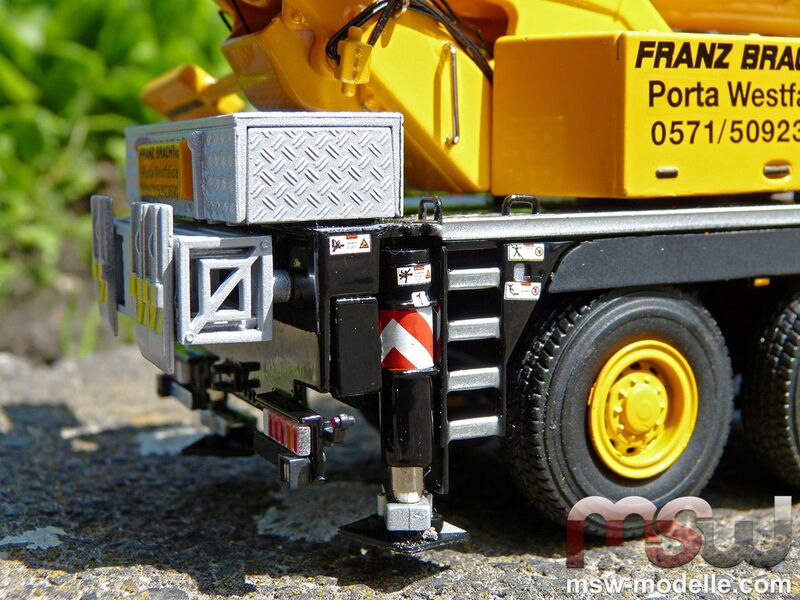 The model features an original sign plate on both front and back of the crane. Warning signs are carefully printed around the whole model. This includes also the address of the real crane’s location in Porta Westfalica. 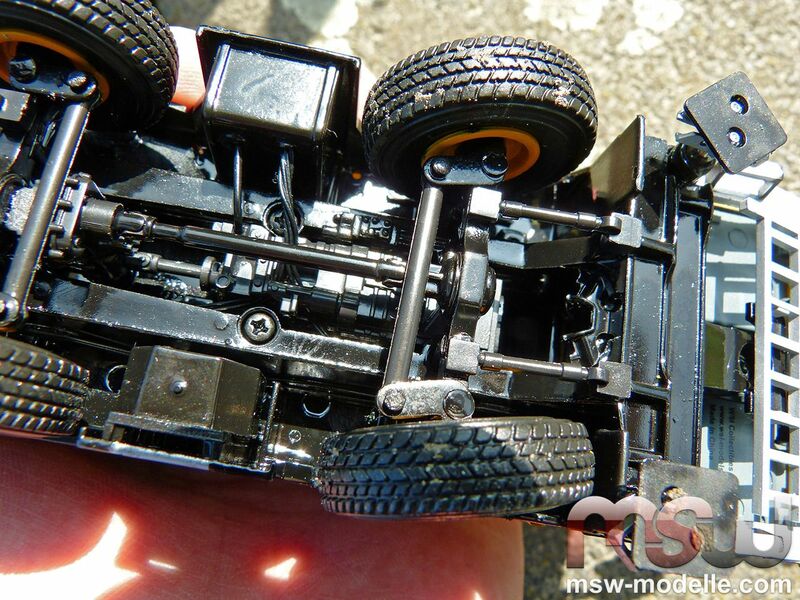 Underneath the front cab a small ladder is assembled. 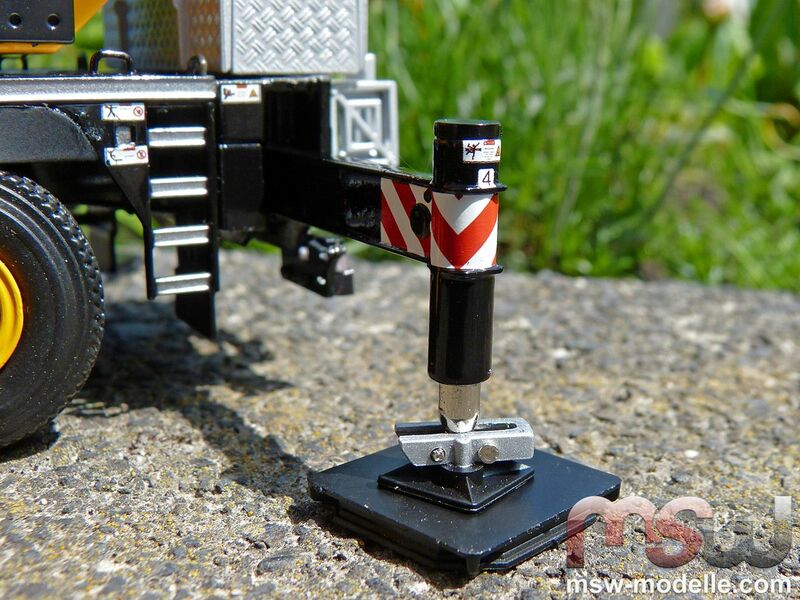 Perfect for a diorama the ladder can be also used when the jib extension would be assembled. Exact fitting grills cover the engine. 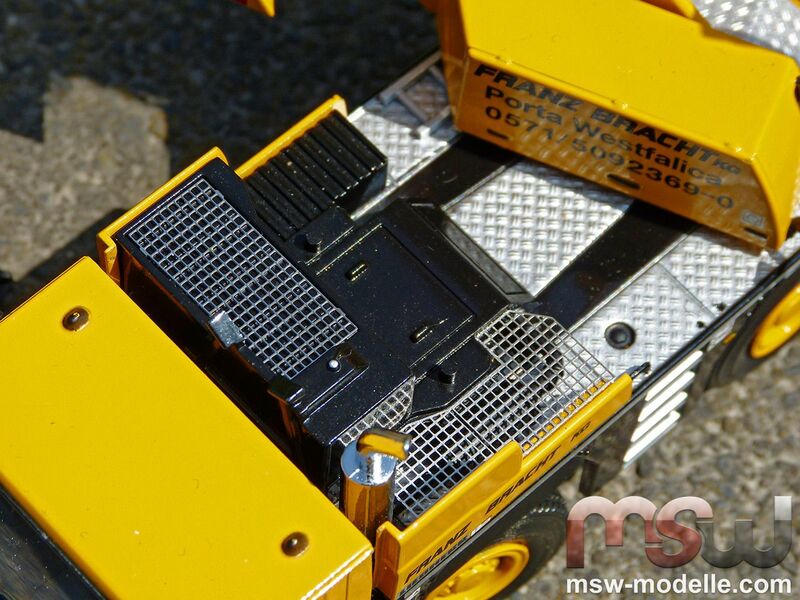 Handrails, mirrors and various warning signs add to the extremely detailed model. 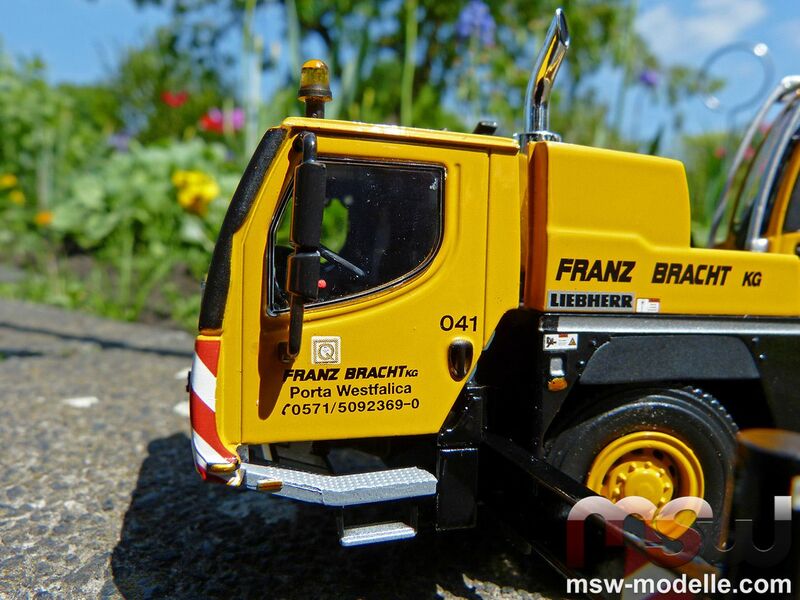 Both operator cabs feature a highly detailed interior with control panels, steering column and hand-levers. All operator seats feature the Liebherr company name. Mirrors, railings and windscreen wipers exist as well. 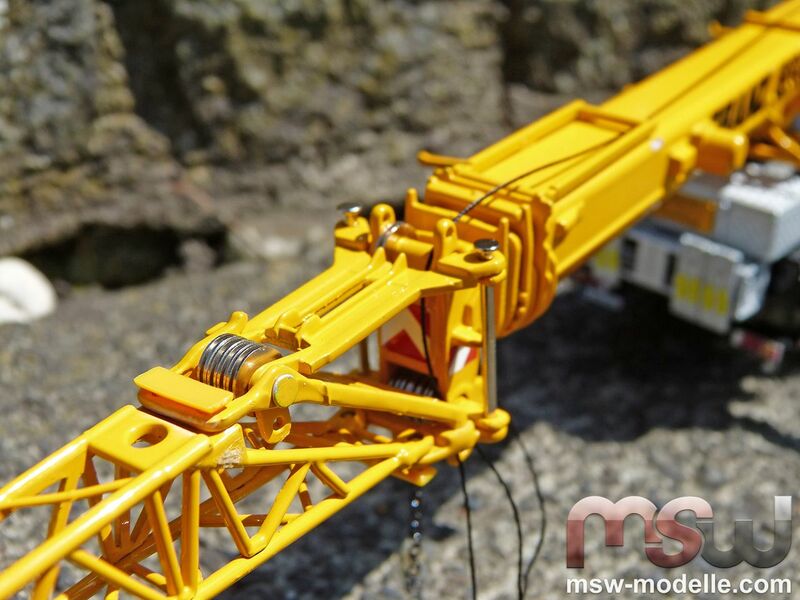 With a high degree of engineering skills WSI copied the crane’s superstructure. 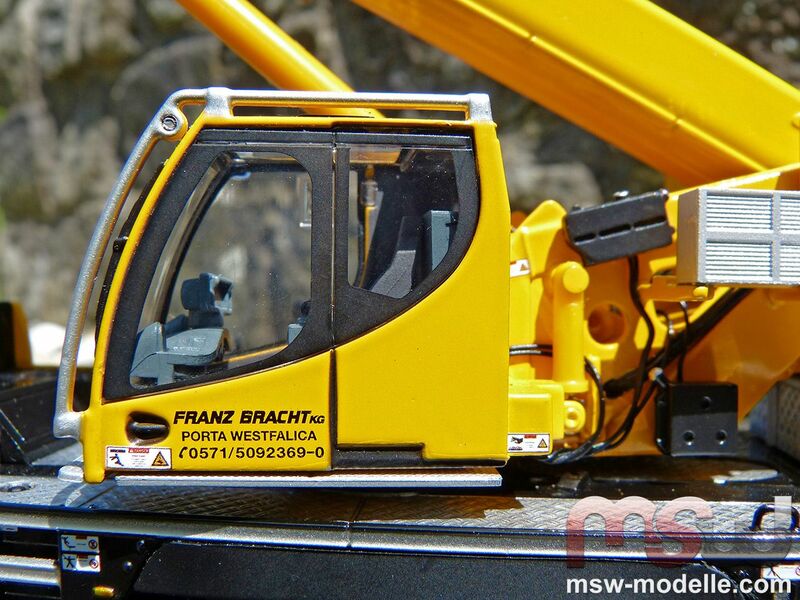 Small hydraulic hose lines are routed to the cab, the hoist cylinder and the hoist winch. The counterweight consists of small plates, which are connected by a small coupling device. This looks really great but a frequent changing is not really recommended. As in reality, changing the line scheme can be easily done via a rope clamp. WSI perfectly realized this feature. Unfortunately the line is a not without twist and this looks simply not really great. But it can be easily exchanged with a twist free rope. 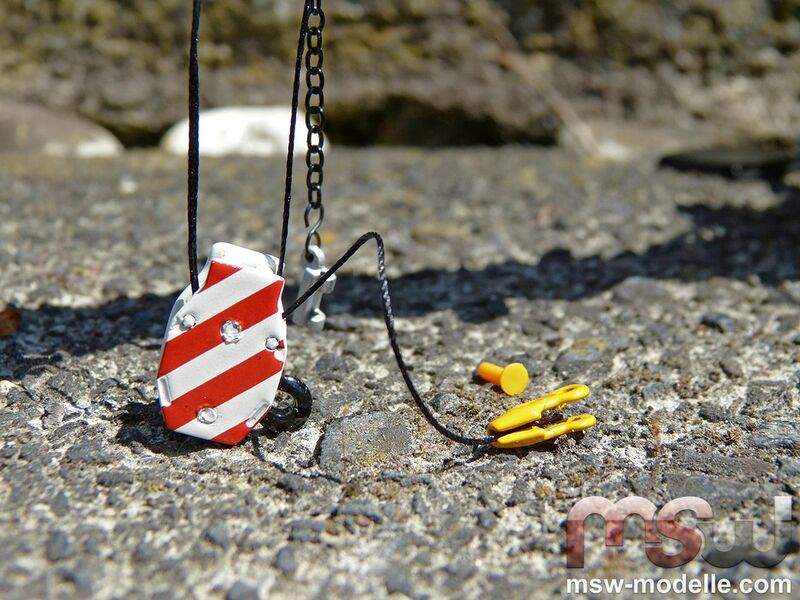 MSW Mietz of course offers here a perfect line to replace the original line on the model. The hoist line is connected to the rope clamp by a small joint. A plastic pin connects the clamp with the boom head. It can be easily loosened and the reeving can be changed for the lattice boom extension. All sheaves are single type ones and rotate easily. The main hook features two sheaves, which is not the real number as on the original crane. 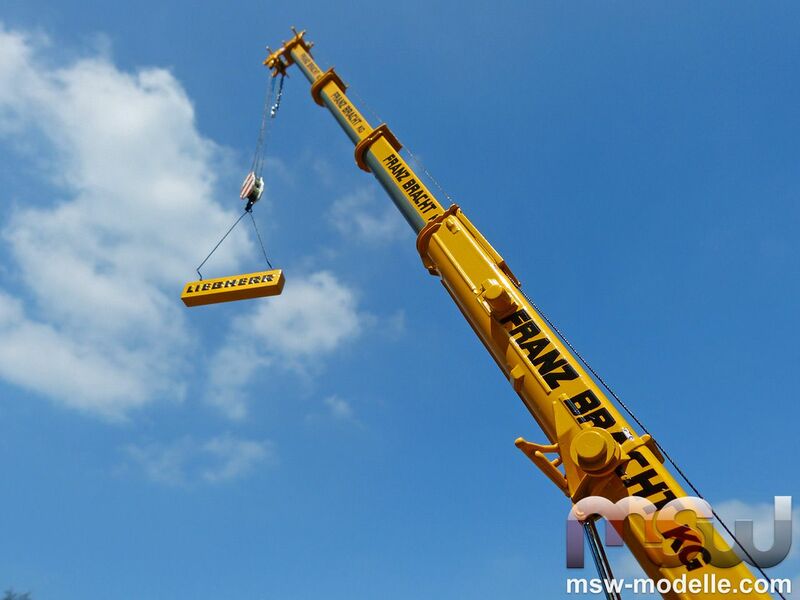 Liebherr offers a 3-sheave hook for a maximum lifting capacity of 30 t on the real crane. 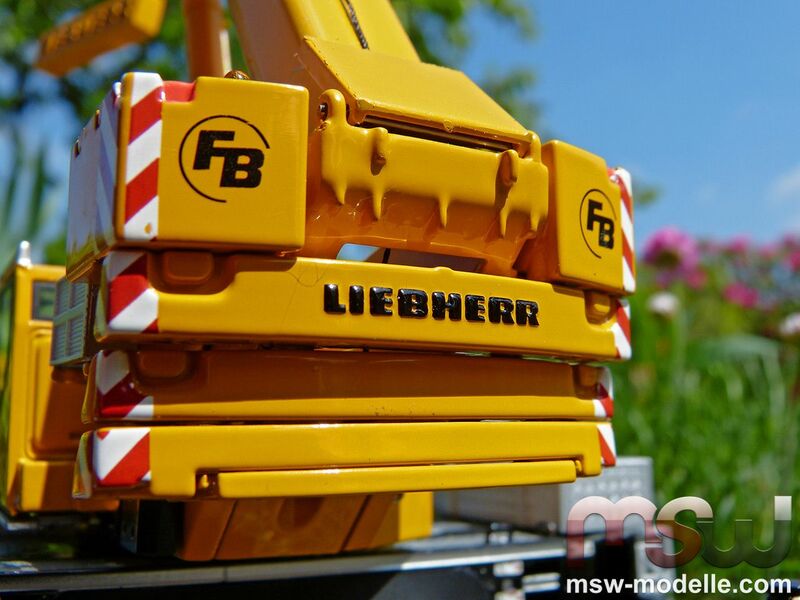 A small weight with the Liebherr name on it keeps the lines under tension. Another amazing feature is the boom. It is really light due to a manufacturing without zinc. Therefore all proportions look much more authentic compared to a boom made of zinc. 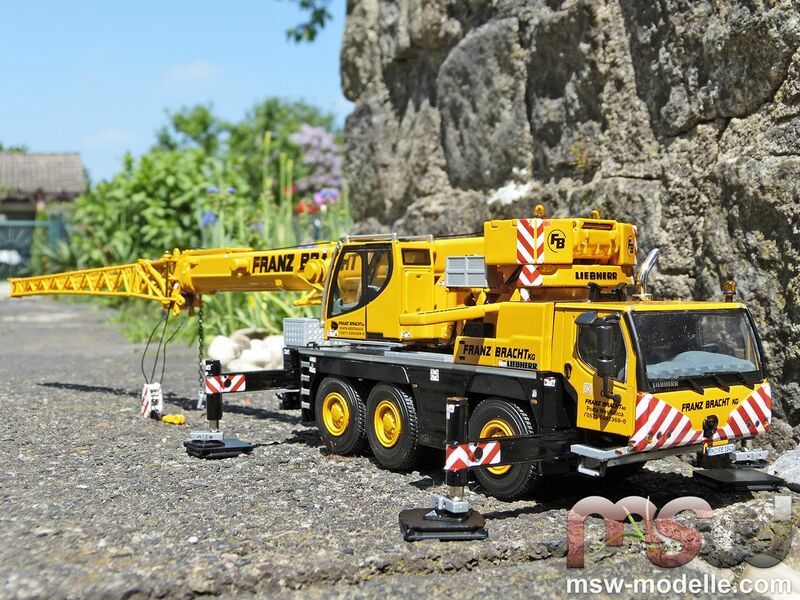 The maximum length is 77 cm or 38 m on the real crane. 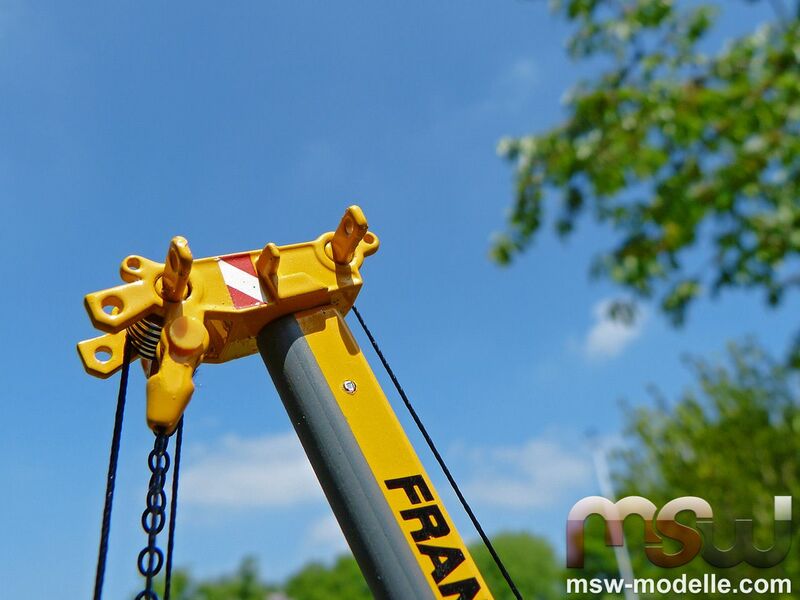 And with the boom extension the maximum length would even be 1.05 m.
Assembling of the boom extension is really easy thanks to the rope clamp. When the boom is lowered the extension is swung into the final position and secured with another pin. The jib extension includes even a small runner with single sheaves. Small pin plates need to be disconnected while using the runner.